The Duke Spirit have been stunning crowds with their sultry and sleazy rock music at festivals (Reading/Leeds/Glastonbury/Isle of Wight and supporting both British Sea Power and the Vines. Now is the time to get some Duke Spirit to take home, ahead of their debut album. ‘Cuts Across The Land’ has a touch of Blondie-esque class, thanks to vocalist Leila Moss, and a solid rock back-up worthy if The Strokes provided by the rest of the lads. 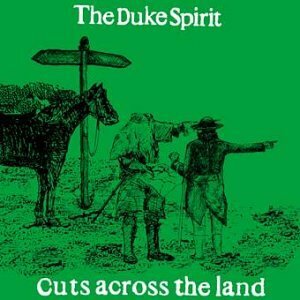 With a familiarity that is comforting and a brashness that is exhilarating, The Duke Spirit create great songs that lodge themselves pleasantly in your head and won’t let go. The Duke Spirit are Leila Moss (Vocals and Harmonica), Luke Ford (Guitar and Vocals), Toby Butler (Bass), Dan Higgins (Guitar and Keyboards) and Olly Betts (Drums).